Disclaimer: As a Rock ‘n’ Blogger I received complimentary entry into this race. I also received a complimentary VIP package. As always, all opinions are my own. 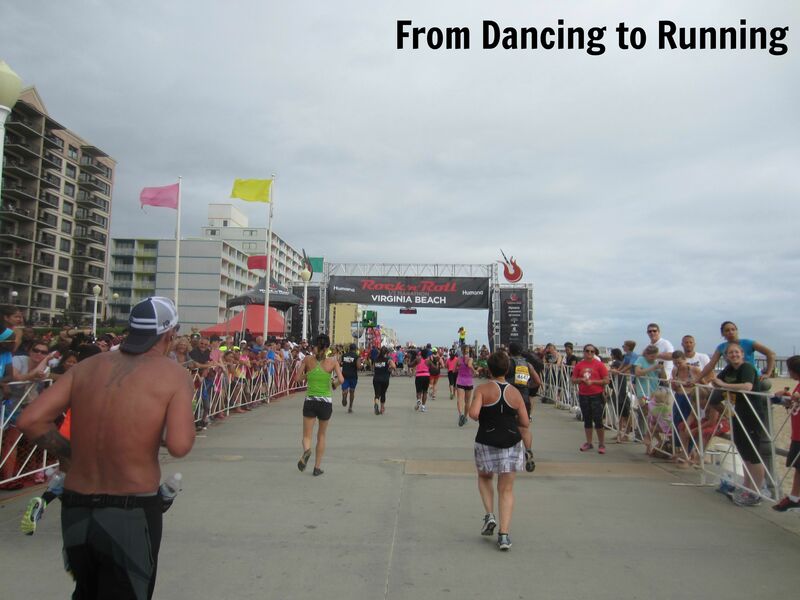 This year was the third year in a row that I looked forward to closing out summer by running Rock ‘n’ Roll Virginia Beach. My first year I ran the 5k, and last year I ran the half marathon. When I registered earlier this year, it was prior to when I became pregnant. Even after I found out that I was pregnant, I kept my sights on being able to still run this race, no matter how slow I had to take it and no matter how many walk breaks I had to take during the race. As I shared throughout my 18 weeks of training for this race, there were some weeks when keeping up with my running was far from easy, especially during the first trimester. But I managed to keep up with it, and managed to make it to the start line on race day. Although Preston wasn’t initially planning on running Virginia Beach with me this year, he changed his mind earlier in the summer, mainly so that he could run the race with me in the event that something happened to me along the course. Labor Day weekend in Virginia Beach is historically hot and humid, though with quite a bit of rain over the holiday weekend this year we got a bit of a break in the heat and humidity. Although it was 81 degrees at the start of the race, the fact that it rained on and off during the race helped to make it feel cooler than it actually was. And as it turned out, there weren’t any emergencies on race day (thank goodness! ), and Preston and I got to just enjoy running the race together. Race morning was a bit hectic, as we were rushed getting out of our hotel room. Just like in past years, we opted to stay in Norfolk in order to significantly cut the cost of our hotel bill. The race started at the Virginia Beach Convention Center, and thanks to my receiving the VIP race day package as part of being a Rock ‘n’ Blogger, we were able to park right at the start line. Within 20 minutes of leaving our hotel, we pulled into the parking lot, and Preston and I briefly parted ways. Since we didn’t want to pay for VIP for him, he headed for the porta potty lines while I headed inside of the convention center to check our gear bag, use the bathroom, and grab some water for the two of us. While inside I met up with Pam and Christine as well as Lacey, and after wishing each other good luck at the race, I headed out to the corrals to meet back up with Preston. Preston and I started in corral 8, my assigned corral. Just as the race got underway at 7:00 a.m., there was a quick downpour. Thankfully, Preston and I had made a last minute decision to wear hats during the race, which helped in keeping the on and off rain during the race out of our faces. The downpour was quick, and the rain let up a bit just as we crossed the start line of the race. The first couple of miles of this race are some of my favorite, where the course takes runners through the southern end of the oceanfront area. The crowd support along both Pacific and Atlantic Avenues is very strong, and its a great confidence booster during the first part of the race. The further we ran during those first miles, the more confident I felt about being able to run the entire race as planned, even being 24 weeks pregnant. My game plan going into the race was to run using 2:15/0:45 min intervals, and other than taking extra walk breaks at the water stations, I was able to successfully maintain my intervals for the entire race. The further that we ran, the more I picked up on the lack of porta potties along the course this year. It seemed like there were way fewer than I had noticed during last year’s race, but maybe part of that was because I didn’t have as much of a need for them when I ran last year while not pregnant. Going into the race I knew I’d need to stop at least once, if not twice. But I also wanted to avoid stopping for as long as I possibly could in the hope that I’d only have to make one stop during the race. Just past the halfway point on the course, I saw a set of porta potties with only two people standing in line. I knew that this was my chance to take care of business without loosing a lot of precious race time. Preston and I were stopped for only about two minutes before we got back on the course and forged forward. The further that we ran through Camp Pendleton, the Marine Corps Base in Virginia Beach, the harder it became for me to get back into my running groove, partly due to the increased pressure that the baby started to put on my bladder and the slightly increasing round ligament pain that I was experiencing the further that we ran. After our porta potty stop, our pace slowly decreased. Although I wasn’t running this race for time, I secretly wanted to beat last year’s 2:30:14 finish time. With each mile that we ran, I knew that we were slipping further and further away from a 2:30 finish time. But in hindsight, that didn’t really matter. I was out running a half marathon at 24 weeks pregnant, and that in and of itself is an accomplishment. The closer we got to the boardwalk, the more excited I became about knowing that I’d complete a half marathon while pregnant. The last mile of the course took us onto the Virginia Beach Boardwalk, which is one of my favorite parts of the entire race. There’s just something about running along the beach that is calming and peaceful, which also helped to take my mind off of the round ligament pain that I was experiencing. I love being able to finish a race on the beach! Just before crossing the finish line, Preston grabbed my hand, and together we crossed at 2:38:02 (12:02 pace), though according to my Garmin we ran the race in 2:36:15 (11:47 pace), as it had paused during our brief bathroom stop. We made our way through the finisher’s chute, collected our medals and lots of food and beverages. 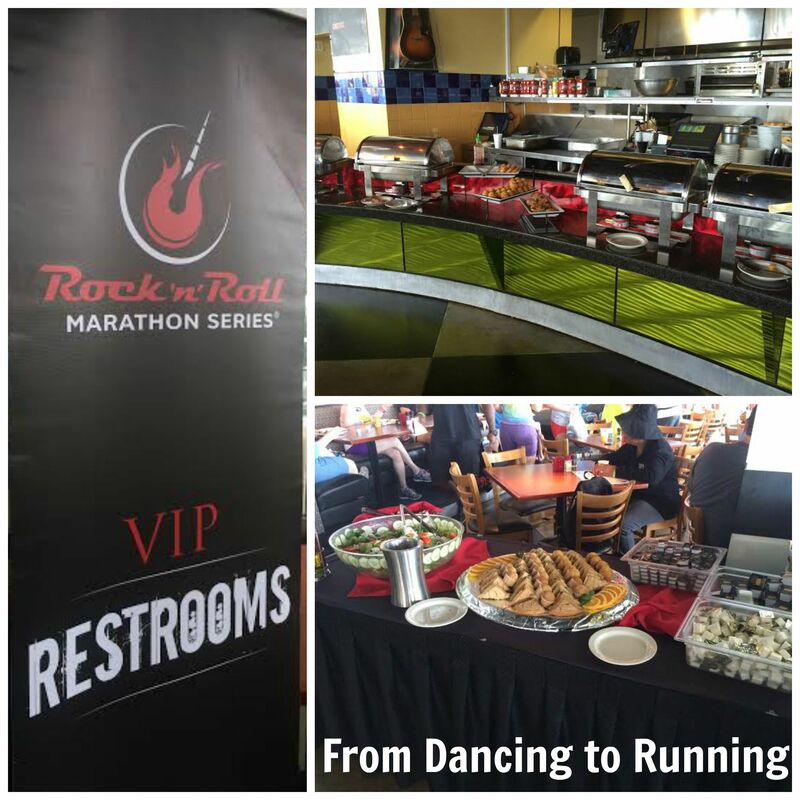 While I love that Rock ‘n’ Roll provides runners with an ample amount of food and drinks, it still frustrates me that we can’t receive bags to put all of our stuff in. It becomes a very difficult balancing act to make it down the chute without dropping anything. Once we had exited the chute, we then went to the Remix Challenge tent so that I could retrieve my challenge medal since I completed the Mile on the Sand the day prior. While Preston hung out on the oceanfront for a few minutes, I retrieved our gear bag from the VIP area at Rockfish. I quickly changed inside at Rockfish, grabbed a quick bite to eat, met up with Lacey, and then we made our way back to the convention center where our car was parked. All in all, it was another great Rock ‘n’ Roll race experience. 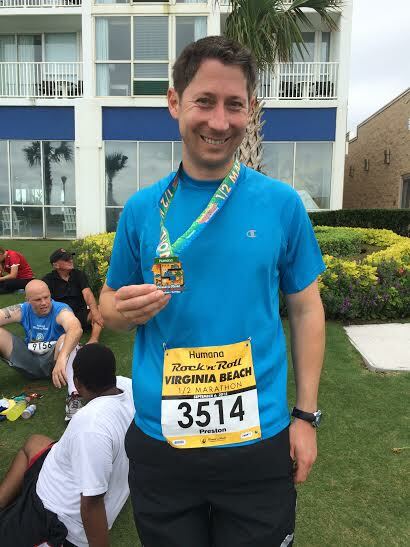 Though there were a few minor details that I would have amended (such as having bags available for runners in the finisher’s chute, and adding some more porta potties along the course), I was very pleased with how the 15th Anniversary of the Virginia Beach race went. There were more than enough water stations, with plenty of volunteers at them. The corrals were well spread out, and other than the first half mile or so, the course did not feel crowded whatsoever. However, the cost of the VIP package was a bit steep this year compared to past years (if my memory is correct, VIP was $69 for Virginia Beach this year), which is why we opted to not pay for Preston to also have the VIP package. The convenience of parking at the start line was great, and that alone was worth having VIP for one of us. However, I didn’t find the pre or post race food spreads to be anything truly spectacular, and I’m glad we didn’t spend the extra $69 on getting VIP for Preston. More than anything else, I proved to myself during this race that I can in fact run a half marathon while pregnant. With another five and a half weeks to go until Rock ‘n’ Roll Philly, time will only tell if I’ll be able to run part of that race, or if I’ll be walking the entire thing. QOTD: What is one of the most challenging things that you’ve done and successfully accomplished? 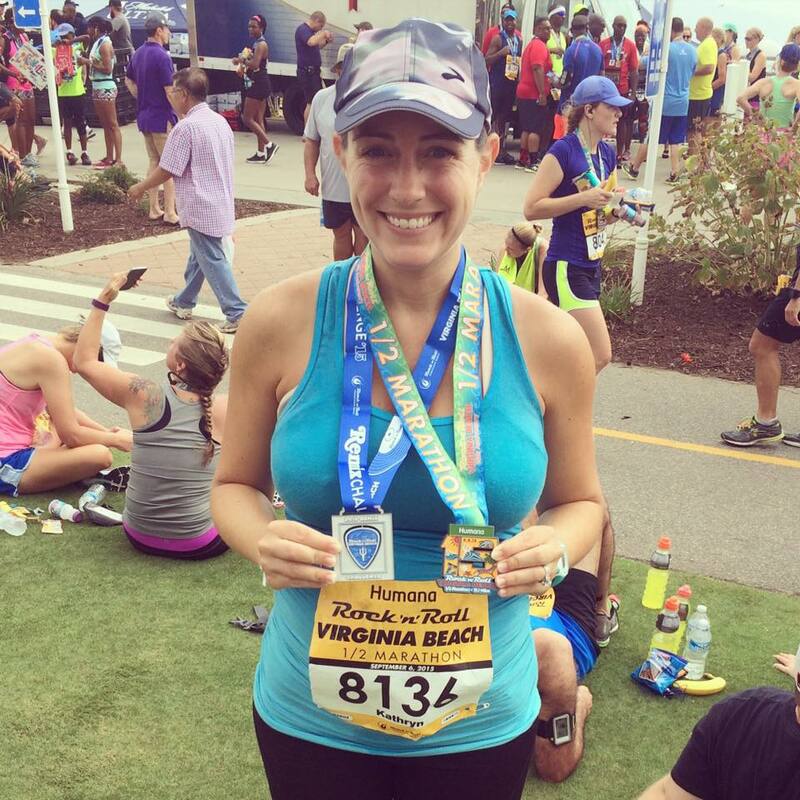 This entry was posted in Races and tagged 15 in 2015, fit pregnancy, half marathon, Rock 'n' Blog, Rock 'n' Roll Virginia Beach, run-walk-run method, running. Bookmark the permalink. Congrats and huge props to you for running a half while pregnant! So awesome! You are simply amazing. As your son grows up he is going to love to hear about all the times you ran with him while you were pregnant! It’s AWESOME! Great job! I had to walk my last half marathon and all I wanted to do was run. But I was injured and knew walking would be the only way I could do it. Definitely better to be safe than sorry. Thanks Nicole. I’ve been so appreciative of his support as well. Congratulations! I totally agree with you, just running a 1/2 at 24 weeks pregnant is an AMAZING accomplishment in and of itself. Congrats on finishing and doing it while pregnant!! Oh we said the same thing about bags for all the food and drinks at the finish line. I thought the heat was bad, but as you pointed out, it is bad every year for the race. It is always fun though and we also agree about the VIP experience. I think it was alot more money this year too. I love that they offer runners a lot at the finish line, its just so hard to carry everything. I think it’s amazing that you finished a half marathon while pregnant!!! Congratulations!!! Missed seeing you as well. You were certainly missed! Congrats! It sure is an accomplishment to run a half while pregnant 🙂 You always do a great job of listening to your body and adjusting to your needs, so I’m sure that you’ll be successful at RnR Philly, too! Great job! This looks like a great race. But I’m glad you listened to your body and took it easy! Awesome job!! 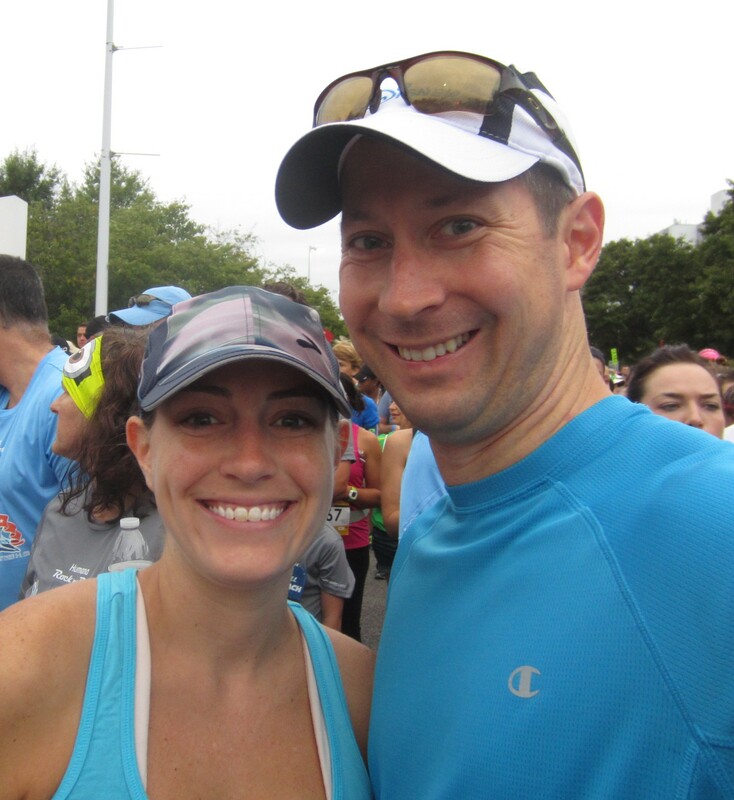 Running a half marathon while pregnant is amazing! Sounds like you two had a lot of fun also!! You are such an inspiration! and I love your recaps and all of the details! You are awesome. 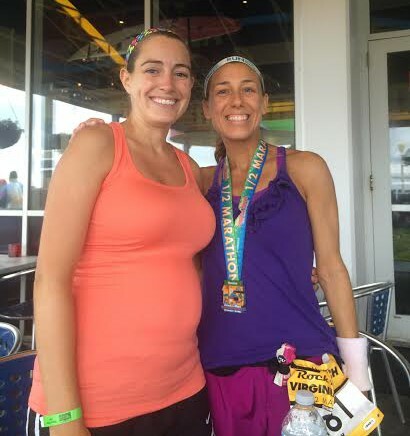 Keep inspiring other runners and moms to be! Congrats Kathryn! I know how hot it is every weekend and you ran a strong race. My husband and I ran the VA Beach Rock ‘N’ Roll Half in 2002 and had a lot of fun that year! Definitely running in the JFK 50-Miler was the most challenging race I’ve completed. It was fun, it was an all-day affair, and it was worth it! Thanks Deb! It was great seeing you as well! Congratulations on your finish! You did an awesome job considering how far along you are. When it started to rain in the beginning of the race I was regretting not wearing a hat. I’m glad that didn’t last for long. It was so nice to see you at the beginning of the race and at Rockfish. That was such a nice treat we were offered. Sorry that I wasn’t able to put the pic of us up on our blog. It just happened so quickly and after you left I realized I didn’t have your number so you could txt it to me. No worries! It was great to see you and catch up a bit after the race! You’re AMAZING. Way to rock this race (no pun intended, haha) even with your little one in tow. 😉 Congratulations! That’s some amaziiiiiiiiiiiing post race amenities! I’m so tired of races only offering the minimum bagel and unripe banana! Me too, especially with how much race registrations tend to cost. You are amazing. The round ligament pain is what kept me from running during my pregnancies, it was really bad. So proud of you!! Thanks Sue! The pain is definitely starting to slow me down. Not sure how much more running I’ll be doing.